Iron Sky: How To Crowdsource And Crowdfund A Story Of Moon Nazis? Iron Sky is a cult film and a story about Nazis who fled to the Moon after World War II, but it is also a story about crowdsourcing, crowdfunding and crowdinvesting. Don’t be offset my very short summary of the movie – it is a clever and often hilarious parody of the relations between the strongest world powers, with elements of steampunk, and a spectacular fight in space. 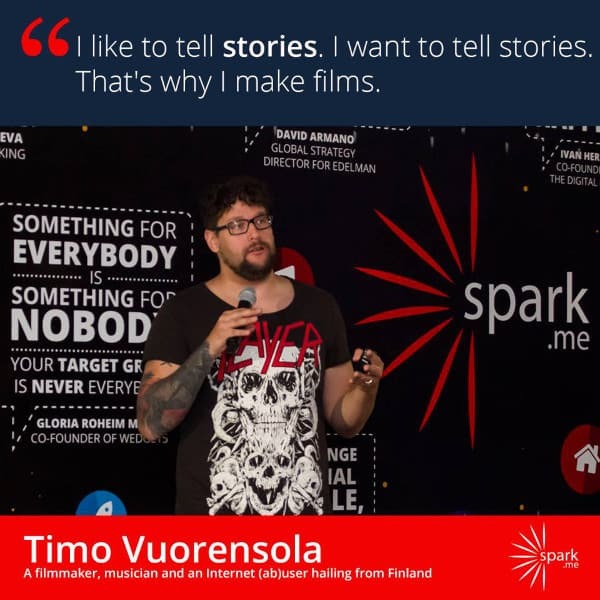 Its director, Timo Vuorensola, took the stage at Spark.Me and said how this all came to be thanks to the power of – crowds. Iron Sky was envisioned, he said, in a very Finnish manner – in a sauna. Timo and his friends were broke, they did not know how to make a film, but they thought they had a good idea. They then decided to co-produce the movie with their audience, through crowdsourcing, crowdfunding and crowdinvesting. Creating the film has its own processes, Timo relates. There is one creator that delegates a multitude of tasks to the rest of the team, which gets interesting when the audience is involved, and participates in sharing knowledge and ideas. Someone had a lot of information about the moon. Someone was excellent with cameras. Someone had the idea how to make the spaceship like it was created in India, Australia (Hey, it’s Sci-Fi!). Someone came up with the anthem of the Nazis from the moon. It was cooperation in every sense of the world. What this means is that everything had to be transparent, and the audience got not only to take a look behind the scenes, but participate hands-on. To create a successful crowdfunding campaign, you have to put in a lot of work first – you need good content, constantly inform the public on your progress and create unique perks for the supporters. The crowdfunding campaign for Iron Sky, part two (spoiler: Hitler has an army of dinosaurs), has a pretty unique perk – the backer of the project gets to be eaten by a dinosaur! The upcoming movie, Iron Sky: The Coming Race, is an amazing mix of conspiracy theories. It will air in 2017, also with the help of group financing. You too can join the fight against Hitler, his army of dinosaurs, lizard-men, and see parody Putin dance.